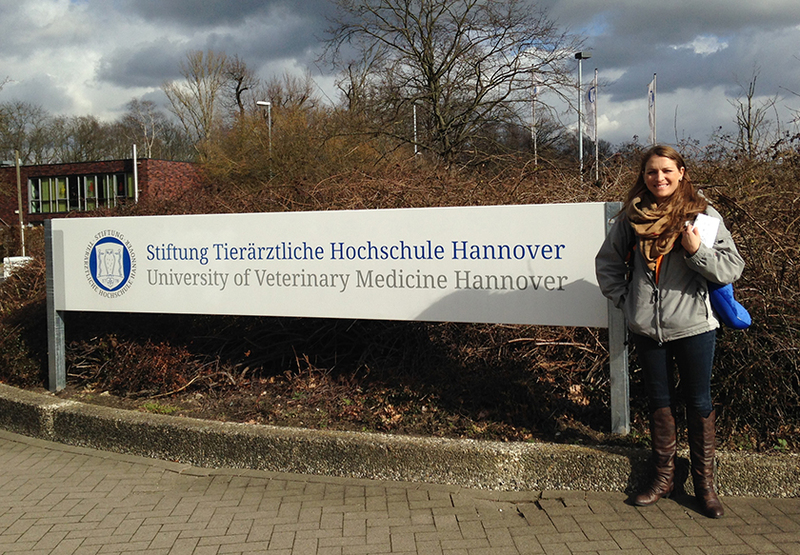 Devin Duffy, class or 2015, at the University of Veterinary Medicine Hannover, for her externship. Auburn University’s College of Veterinary Medicine has initiated a new academic exchange program with the prestigious University of Veterinary Medicine of Hannover, Germany. The initiative was started by Dean Calvin Johnson and Dr. Haroldo Toro, a professor in the Department of Pathobiology. These activities were begun in an effort to respond to the interest of then-veterinary student Devon Duffy, who graduated with the class of 2015, to specialize in diseases of wild and pet birds as well as other exotic animals. “The college is always interested in enhancing the educational experience by bringing international perspectives into domestic practice, and providing immersive cultural experiences that enhance global awareness and competence in our students” Dr. Johnson said. 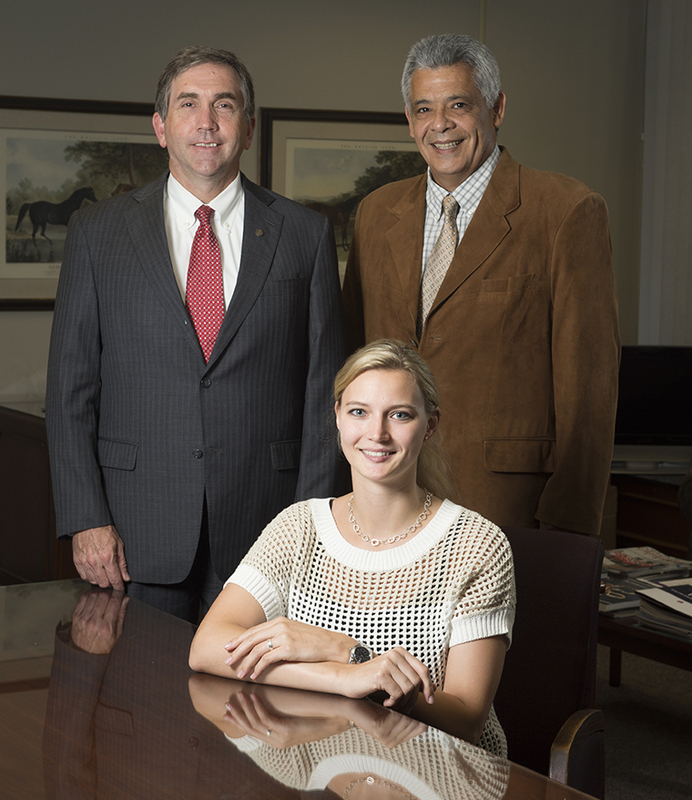 Dean Calvin Johnson, Dr. Haroldo Toro and Hannover student Johanna Kennedy, who spent the summer at Auburn’s College of Veterinary Medicine through the exchange program. Dr. Norbert Kummerfeld with the Klinik für Heimtiere, Reptilien, Zier- und Wildvögel, or Clinic of Small Mammalian, Reptiles, Pet and Wild Birds, agreed to receive Duffy for an eight-week clinical rotation this past spring. Following her externship, Duffy said “the Germany trip was amazing and has impacted my life for the better. I hope this will be a trip other students will be able to enjoy for many years to come”. Before departing for Germany, Duffy was provided with a presentation about Auburn University by Dean Johnson so that she would act as an ambassador and recruit a German veterinary student to participate in the clinical rotation provided by the Auburn veterinary college. This necessary reciprocal initiative would provide the foundation for an academic exchange program with Hannover University. As a result of her successful presentation at the Institute, German veterinary student Johanna Kennedy initiated communications with Dr. Toro to coordinate an externship at Auburn’s College of Veterinary Medicine. Further details were discussed in Hannover by Dr. Toro and Dr. Christiane Pfarrer, professor and vice president at Hannover University. From these conversations, Kennedy received academic support as well as funding from Hannover’s Office of Foreign Exchange programs. Thanks to the diligent organization by Dr. Dan Givens, associate dean for Academic Affairs, as well as the great work by all faculty members at the Auburn University Veterinary Teaching Hospital, Kennedy’s experience this summer at Auburn was wonderful and productive experience. 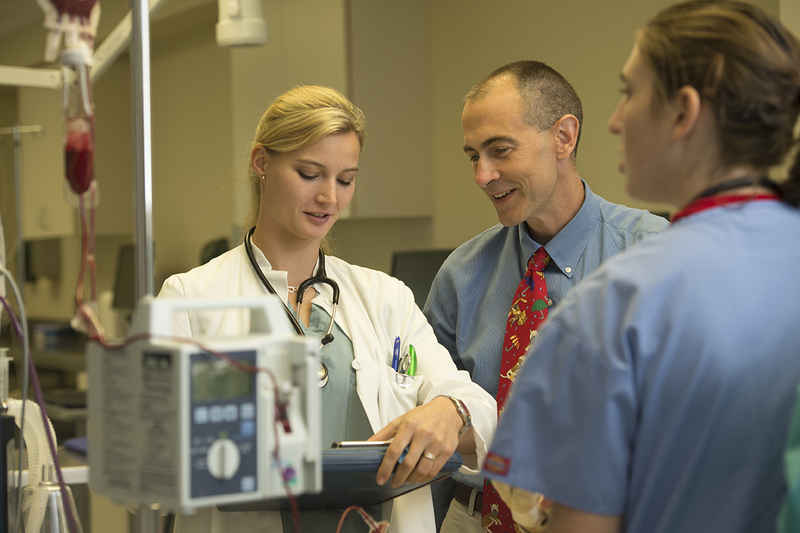 Johanna Kennedy spent a portion of her educational experience at Auburn in the Bailey Small Animal Hospital’s Anesthesia Service training with Dr. Jacob Johnson. “Seeing a case through from beginning to end isn’t something I’ve had the opportunity to do before, and it was wonderful,” Kennedy said. “It was a great experience. Because of the interest of Auburn University’s administration in encouraging and facilitating international activities for its students, Dr. Andrew Gillespie, assistant provost for International Programs, has agreed to support this programby providing funding for travel for the next Auburn veterinary student going to Hannover. 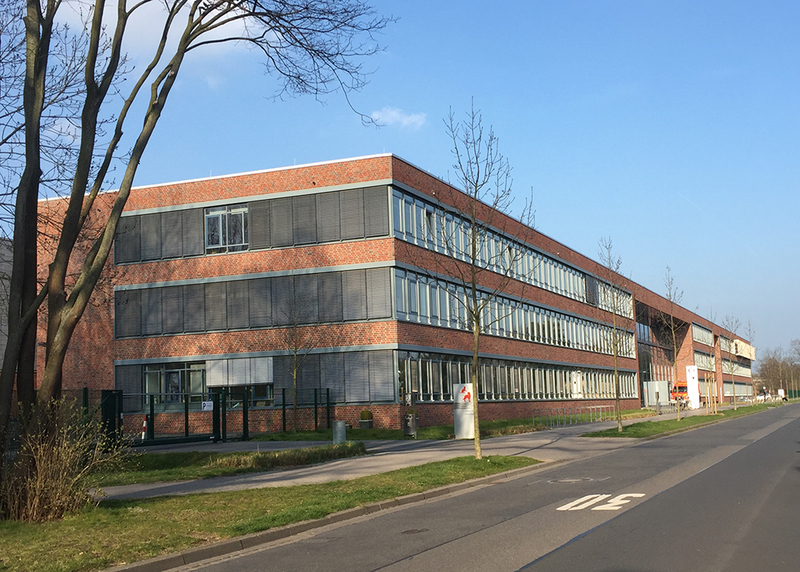 Dr. Toro hopes to build support for the Auburn-Hannover exchange by encouraging other institutions such as the German Academic Service of Academic Exchange to support these mutually beneficial cooperative activities.